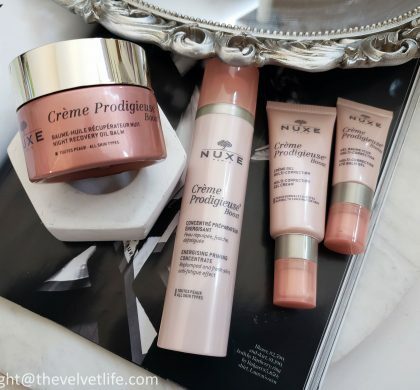 Eye creams are an essential part of the skincare routine. Being the most delicate area on the face, the eye area needs extra care to keep it moisturized as well as the treatment for the kind of concern on the eye area. I started using eye cream when I was in my late 20s and I still feel I should have started earlier. Now, almost in my mid-thirties, I do not see any big concerns but there is always that tiredness, and sometimes puffiness due to the daily stress factors, sitting in front of the screen all day, full-time job, less sleep, two little kids, it is bound to affect my skin and health unless I take care of it. I was never even noticing much tired or puffy eyes, maybe life is too fast and I just do not get enough time to see myself or compare myself with how my eye area looked a few years back. But since I changed and started with new eye creams for brightening, puffiness, and lines, I have become such an advocate for them. My eye area looks bright, fresh and is all plump with no fine lines. 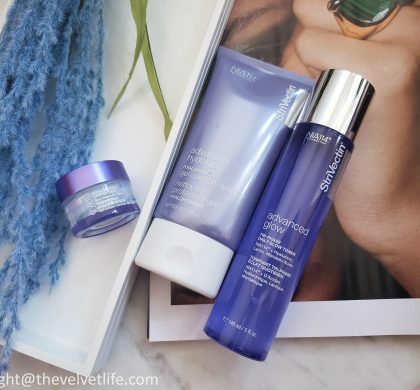 At one time, I am rotating few products based on what my skin needs, the same way I have these three eye cream which I am loving these days and rotate them based on what I need. For the days, I feel dryness, I go for more hydrating eye cream. For the days, I did not sleep well or did not get enough sleep, I got for the brightening one. I am glad all the eye creams I am talking about in this post are keeping my eye area without wrinkles or lines. Darphin Stimulskin Plus Multi-Corrective Divine Eye Cream (CAD $160) for youthful, firm, and bright eyes is described as a total anti-aging transformation for eyes. It contains Youth Activating Crystal Resin, Luminizing Jade Powder and Potent Sea Emerald that combine for collagen-boosting rejuvenation and radiance. key for optimal cellular activity. Increases natural collagen production and promotes the dermal re-densifying process. Sea Emerald – Helps to improve skin cohesion and restore natural bounce, and helps reinforce the natural production of collagen. It is a botanical jewel which is extremely rare and as expensive as caviar, to help lift, firm and re-volumize skin. Siegesbeckia Orientalis – This botanical extract supports natural collagen, thus helping to maintain skin’s structural integrity for a smoother appearance. The look of lines and wrinkles is reduced. Commiphora Mukul – Helps visibly restore volume from within, so skin resists the loss of its youthful, natural cushion and maintains firmness and elasticity. Jade Powder – Micro-fine powder from this powerful stone creates an immediate brightening effect. Sea Bouquet – Algae extracts help to reduce dark circles and puffiness over time thanks to the natural polysaccharides they contain. 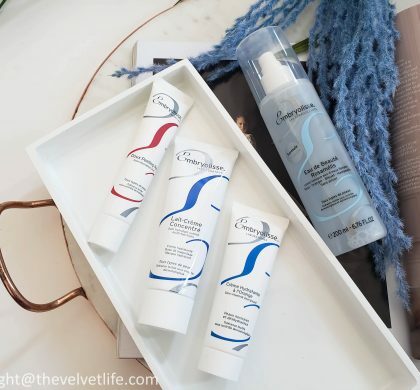 There are two multi-corrective massage tools included with Stimulskin Plus Eye Cream, not shown in the pictures, which help massage the eye area from inside to out and also for lifting the area upwards. The eye cream comes in a sturdy heavy jar and I take my spatula to take out the pea sized amount. I have used this eye cream for more than a month regularly and now using this in rotation with the other eye creams. My eye area looks firmer, smoother, and appears more lifted. The eye area is well moisturized and I do not notice the few fine lines I started noticing a few months back. It does help with the puffiness and the dark circles, which are so un-invited guests these days as I do tend to get less than 6 hours of sleep on most days. I do notice there is the luminizing or illuminating effect on the eye area, it appears so healthy and youthful when I am using this eye cream regularly. I am very impressed by the results from this eye cream and do not want to be without it ever. 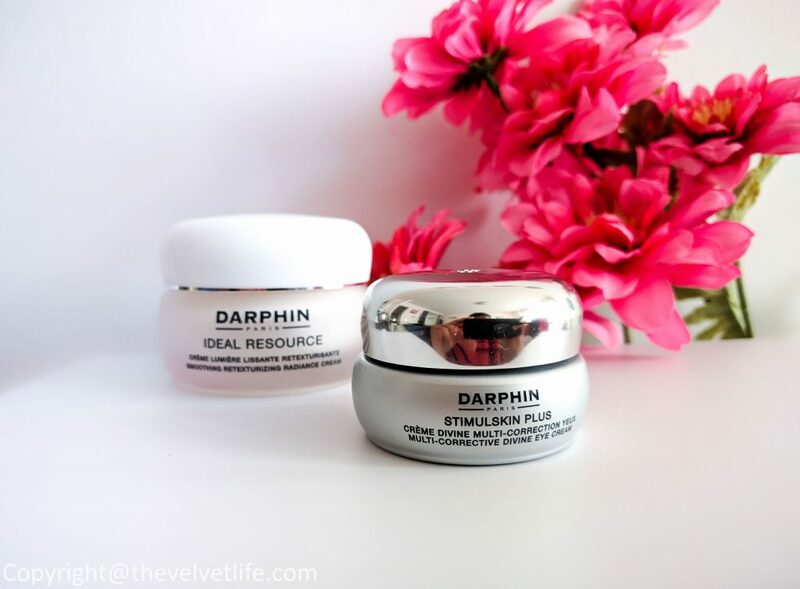 The moisturizer I am loving from Darphin from the Ideal Resource line I reviewed here which is almost empty. 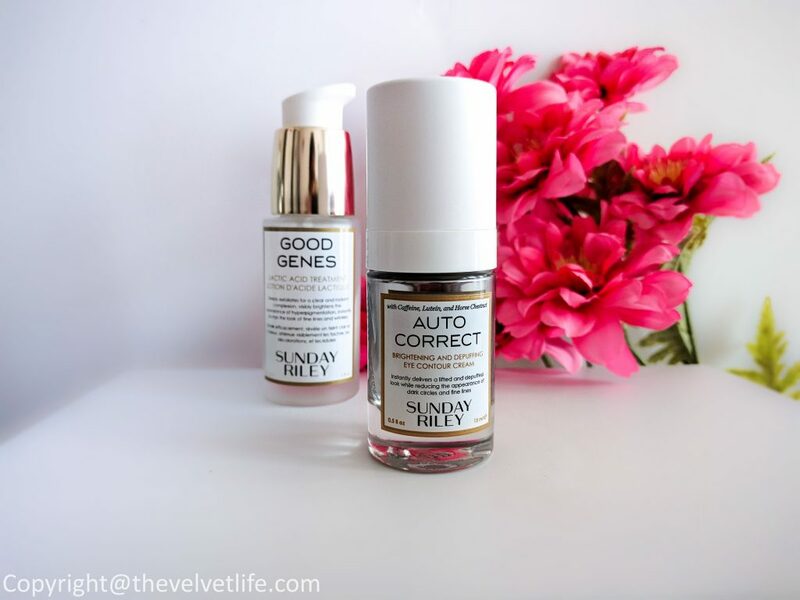 Sunday Riley Auto Correct Brightening And Depuffing Eye Contour Cream (CAD $85) is described as an eye cream that delivers a lifted and depuffed look to the eye area while rapidly reducing the appearance of dark circles and fine lines. 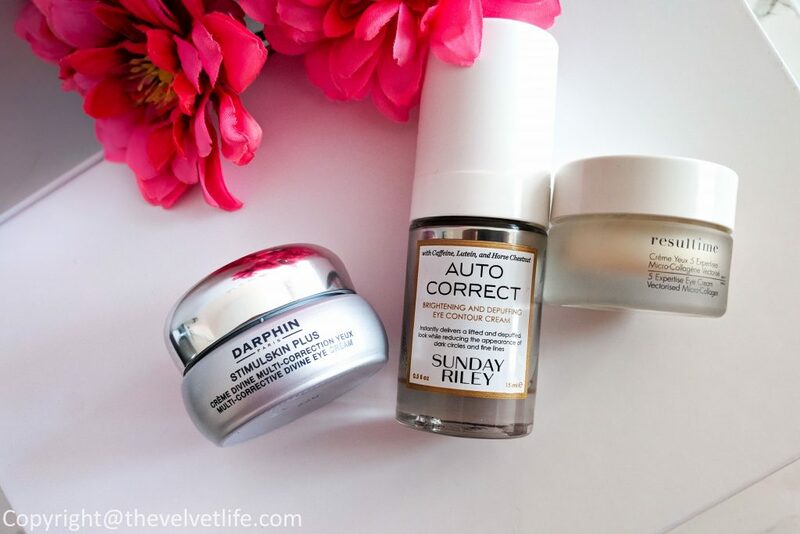 Sunday Riley Auto Correct Brightening and Depuffing Eye Contour Cream gives a brighter, lifted look while reducing the appearance of dark circles and puffiness. Caffeine and Brazilian ginseng root extract rapidly reduce the appearance of puffiness and dark circles, energizing tired-looking eyes. Concentrated horse chestnut and acamella oleracea extract smooth the appearance of crow’s feet and fine lines while giving a lifted look. Antioxidant-rich lutein provides a radiant glow to the fragile skin around the eye. Cocoa and shea butter plump the skin with moisture, as watermelon rind extract and sodium PCA infuse hydration into the skin. Eyes look fresher, younger, depuffed, and more rested for immediate and noticeable results. The product comes in pump dispenser and half pump is all I need for one time use for both eyes. 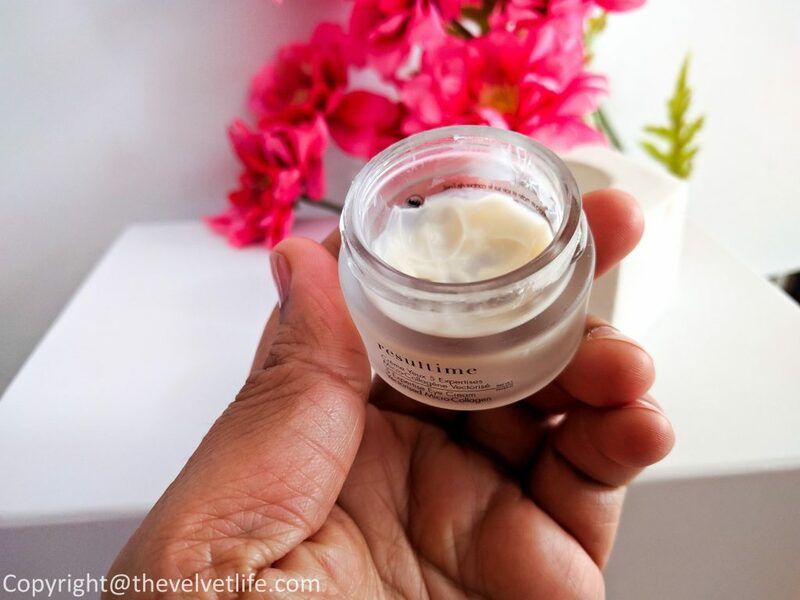 I have used it regularly for more than three weeks and then continue to use this in rotation with my other eye creams and have noticed my eyes feel well rested, fresh, with no puffiness on the days I have lack of sleep. Along with that, I notice few fine lines which are not much noticeable and no wrinkles in the area, it does keep the area very moisturized. My eyes and eye area is sensitive and I did not notice any irritation or eye-watering when I use this eye cream. After cleansing in the morning and evening, I pump a pea-sized amount of Auto Correct onto my ring fingers and lightly pat onto my eye area, taking care not to apply the product too close to the lashline. I follow up with my face oil and moisturizer. There is no impact on the application and staying power of the makeup over it during the day. Another thing I do with this eye cream is to keep it in the fridge, it gives such cooling effect once applied. Another favorite from Sunday Riley is the Good Genes I reviewed here. Resultime by Collin Paris – 5 Expertise Eye Cream (£40.70) is described as an eye cream that uses a unique formula to fight the five signs of aging in the eye contour area: dark circles, puffiness, fat pockets, wrinkles and sagging. It provides a rejuvenating boost for your eyes. This is the eye cream I have used for a few years already (on and off as not available in Canada) now, I think I am on my fourth or fifth jar. I purchased this for the first time when I was in London and then repurchased from CultBeauty website. I do not find it on their website anymore and as you see in the pictures, I am almost done with this jar too. But I am glad I am using some amazing eye creams mentioned above but I will surely repurchase on my next trip to the UK or Europe. I apply in the morning and evening, starting from the corner of the eye, massage using small circles and smoothing movements. I smooth over the eye contour area using your fingertips, then gently tap the remaining product into the skin to penetrate.